Well its been longer then usual since my last post. This past weekend was commencement at my host institution; and I spent it with my friends who graduated with their Master’s degrees (myself included) and family who came down to visit. But today I’d like to talk about something that is crucial to my own research, B-Tagging. Or, the experimental tools we (as high energy physicists) use to identify b-jets. Here b stands for the “beauty” or “bottom” quark; these are two interchangeable terms for the same particle. But first, what’s the big deal about B-Tagging? Well, many current Standard Model physics process under study at the LHC have a b and an anti-b quark (termed bbar or simply b) in the final state. To understand what “final state” means, let’s look at an example. Suppose in a proton-proton collision a top quark, t, and an anti-top quark, t, are produced (this is called top-quark pair, tt, production). Well the top quark decays to a W boson, and another quark, q, ~10% of the time . i.e. Where q = d, s, or b. Then the final state for this event is two oppositely charged leptons, two neutrinos, a quark, and an anti-quark (These quarks will turn into jets as they cannot exist freely, more information on this below). But when looking for top-quark pair production events in a collider, it’s easiest to find them if you look for events containing two b-jets along with the charge leptons and neutrinos. In addition to top-quark pair production, the Higgs Boson is theorized to decay into a bb final state; which in turn form two b-jets (see one of my older posts here, or one of Flip Tanedo’s posts here for more details regarding the Higgs Boson). But b-jets don’t just don’t come from Standard Model processes, many new physics searches (such as supersymmetric searches) have bb final states. With this in mind, it is of paramount importance to be able to find and identify b-jets. But to do this we first need to understand the properties of the b quark itself; or more importantly b-Hadrons as these are what we actually observe. B-Hadrons are rather unique in elementary particle physics. They offer us a chance to study so much; we are able to use them to investigate topics from Quantum Chromodynamics, to CP-Violation, and even physics beyond the Standard Model. Simply put, B-Hadrons have got it going on! They are very heavy particles, with rest masses of approximately 5-10 GeV/c2; or roughly five to ten times the proton’s rest mass . B-Hadrons are also very “long lived” particles, with mean life-times of approximately 1.6 pico-seconds, or 1.6·10-12 seconds. 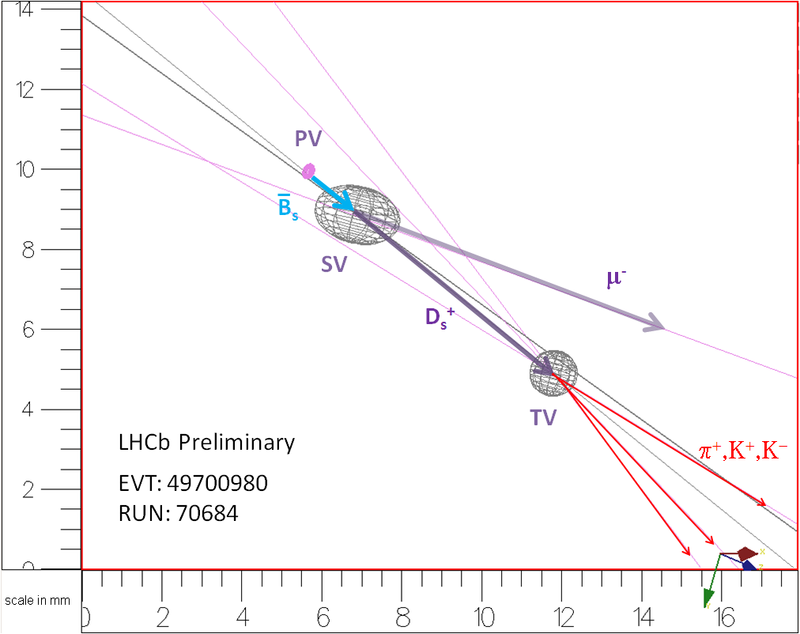 For comparison, the π0 meson has a lifetime of roughly 8·10-17 seconds ; and the top quark has an even shorter lifetime of ~10-23 seconds. So B-Hadrons are very long lived indeed. In fact, because of this long life-time a B-Hadron has a cτ of approximately 480-500 micro-meters (τ being the proper time, or the B-Hadron’s mean life-time; and c is the speed of light). Putting this into more tangible terms, a B-Hadron will travel roughly half a millimeter before it decays. For comparison, the π0 meson has a cτ of only 25 nano-meters (2.5·10-8 meters). In addition to their long life-time and large mass, a B-Hadron will produce five charged particles per decay (on average)! In comparison a Δ++ (a light baryon made of u quarks) will produce only 3 charge particles per decay; and a π+ (a light meson made of a u and d) will produce merely a single charged particle per decay. Also, when a B-Hadrons decays, there is a 10% chance that a lepton will be produced during the decay process. But what does this have to do with B-Tagging? For this we must ask ourselves how these properties listed above would show themselves within our detectors. But what causes this clustering/jet structure to occure? Well when protons collide in the LHC, a quark or gluon may “escape” the proton it was originally found in. But quarks/gluons cannot exist freely in nature! Thus quarks/anti-quarks use some of their kinetic energy to pull other quarks/antiquarks out of the vacuum to form hadrons (this is called hadronization, see one of Flip’s old posts here for more info). And gluons “split” into a quark an anti-quark pair. The produce quark and anti-quark in this “gluon-splitting” will then in turn undergo hadronization process. But this all occurs within a jet! So these B-Hadrons that we have been talking about are going to be found within jets. So b-jets must have B-Hadrons inside them (hence the name)! Now here is where our B-Hadron properties start to come into play. Since a B-Hadron has a long lifetime, and travels some distance before decaying, we are able to look for what’s called a secondary vertex (SV). A SV is a spot that new particles spew from because of the decay of a heavier particle (creating tracks if these new particles have an electric charge). So if a jet has a SV it is much more likely to be a b-jet. To get an idea what an SV might look like in our detectors take a look at this image uploaded by Anna Phan. Here a B-Hadron (Bs) has decayed into a charmed hadron (D+) and a muon (μ); the charmed hadron has then decayed into three other particles (hence a total of five charged particles were produced due to the B-Hadron’s decay!). Notice how these particles are collimated and clustered together, i.e. this is a jet; and in this case it is a b-jet! Also, because many charged particles are produced by a decaying B-Hadron, a jet that has a large number of tracks within it is more likely to be a b-jet. So these four tracks that are produced after the SV (image I linked above) gave experimentalists in the LHCb Collaboration the ability to determine that this was a b-jet. Had this jet come from say, a pion or a Δ++, there may have only been one or two tracks, and it would not be tagged as a b-jet (and rightly so!). Finally, this picture has also shown the B-Hadron having a lepton (the muon) in its decay chain. As a result, experimentalists look for jets that have nearby leptons when looking for b-jets. So from our list of B-Hadron properties we were able to construct a list of what to look for when attempting to perform B-Tagging. But that wraps up our discussion for today. There are many more levels to this then I’ve illustrated here. If you are interested in more details, simply post below and I’ll try to answer your questions! One last piece of information, creating the tools to perform B-Tagging is not something that one person alone can do. For example, CMS has a very large staff of researchers (over 100) who focus directly on developing techniques these techniques that I spoke on briefly. Needless to say, without the researchers who develop these B-Tagging techniques, my own research would be impossible! Particle Data Group, http://pdg.lbl.gov/2010/tables/rpp2010-sum-quarks.pdf, May 11th 2011. Particle Data Group, http://pdg.lbl.gov/2010/tables/rpp2010-sum-mesons.pdf, Math 11th 2011.